Location Between Broadway & 4th Ave. Interesting Facts With no practical theatrical experience at all, A.M. Palmer took over this failing variety house and turned it into one of New York's most successful theatres with a renowned theatrical company. 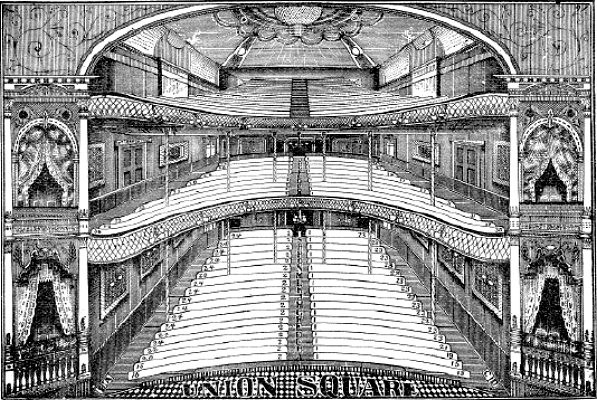 When Palmer departed in 1883, and the northward movement passed it by, the Union Square Theatre became a vaudeville and finally a movie house, when toward the end it was advertised as the only "American Soviet Kino" with a straight diet of Soviet films. Joseph Haworth first appeared at the Union Square Theatre on April 13, 1884. The play was The Fatal Letter by A. R. Cazauran, a writer widely known for his work adapting French dramas for the American stage. The plot involved a wife’s discovery that her husband had betrayed the Confederate government to Union soldiers, causing the death of her father and brother. The play’s conflict was between the wife and husband over custody of their only child. The April 15, 1884 New York Times called Joe’s performance as the husband "well sustained." The play itself was judged over-long, although it drew large and enthusiastic houses throughout its run. Joe rehearsed The Fatal Letter while performing with John McCullough in The Gladiator, Richard III, Virginius, Othello, and Ingomar at the Novelty Theatre in Brooklyn. The Fatal Letter was the first time New York audiences saw Joseph Haworth in intimate drawing room drama, a departure from the classical and "toga" productions of McCullough. Haworth was back at the Union Square in September 1885 in A Moral Crime by Elwyn Barron, a dramatic critic of Chicago. It was a melodramatic story of a young waif, Mathilde, who was first rescued and then betrayed by a corrupt abbot. In an effort to spare another young girl a similar fate, Mathilde shoots and kills the religious hypocrite. Joe played Philippe Count d’Albert a friend of the abbot, who uncovers the crime, learns its true nature, and falls intensively in love with Mathilde. Their love scene was remarkable for its powerful effect on audiences, and Joe moved to the forefront of matinee idol heartthrobs on the New York stage. A Moral Crime was originally booked for a two-week engagement at the Union Square, but wound up playing through the end of the year. Julia Marlowe summarized her opinion of Joe’s work in this play by writing: "…Mr. Haworth’s performance exhibited the very highest qualities of a romantic actor." 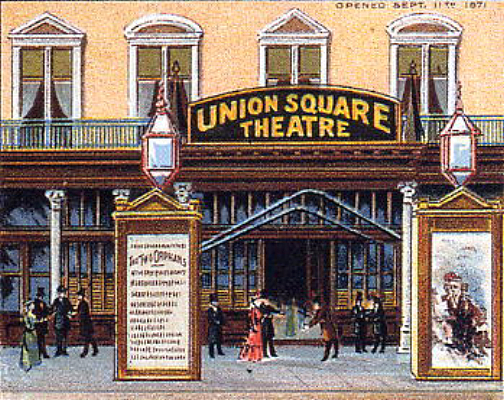 In November 1886, Joe’s younger brother William Haworth acted at the Union Square Theatre in support of Helene Modjeska. Joseph Haworth had played Orlando in As You Like It opposite Mme. Modjeska the previous February and introduced his aspiring brother to the great star. 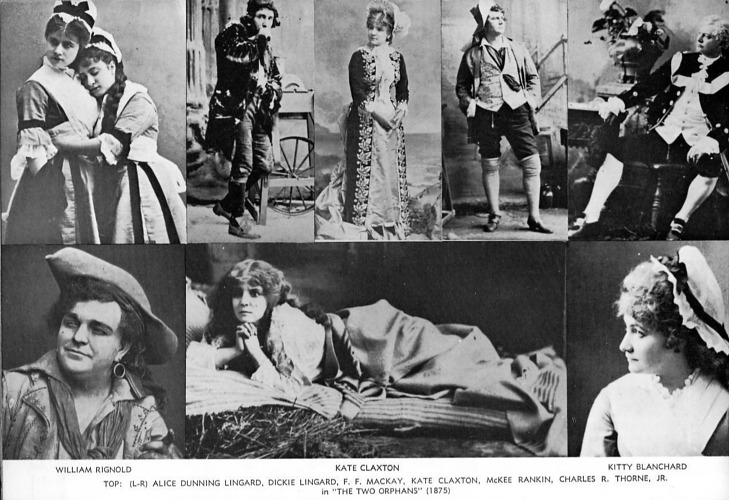 The Modjeska repertory again included As You Like It, this time with Maurice Barrymore as Orlando. Cast as Oliver, Orlando’s abusive older brother, William Haworth grappled physically each performance with Barrymore, a former Marquis of Queensbury champion boxer. Modjeska was pleased with William Haworth’s work, and she cast him as Pille Miche in Balzac’s The Chouans. The heavily plotted novel did not adapt easily to the stage, but the production did good business and had some who ardently admired its dramatic plot of mystery, fighting, spies, danger, and melodrama. This engagement gave William Haworth important exposure in New York, and led directly to his assuming the lead in William Gillette’s Held by the Enemy when its New York production went on tour in 1887. William Haworth left New York and two years of touring later, returned with a completed play. 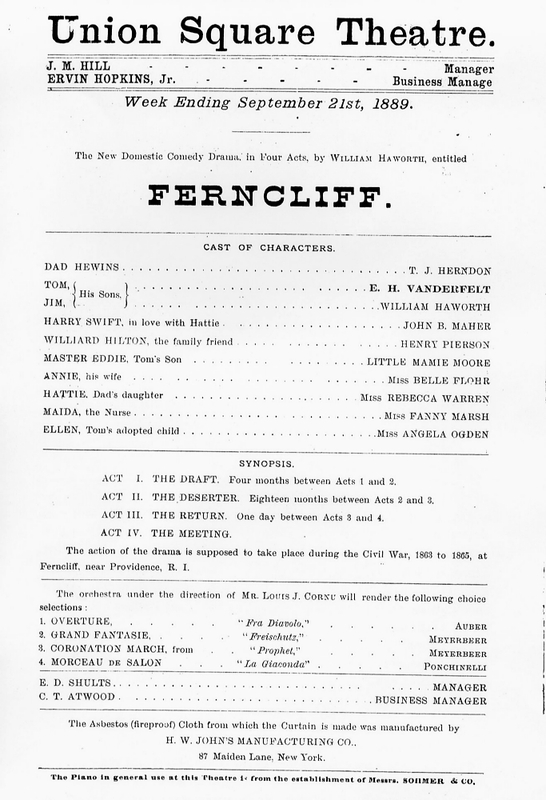 Ferncliff was a modest New England domestic comedy-drama set against the backdrop of the Civil War. It had a cast of ten characters, simple production values, and was an addition to the recent canon of plays by American authors with homegrown stories and themes. In September 1889, Bronson Howard’s Shenandoah opened in New York the same week as Ferncliff. 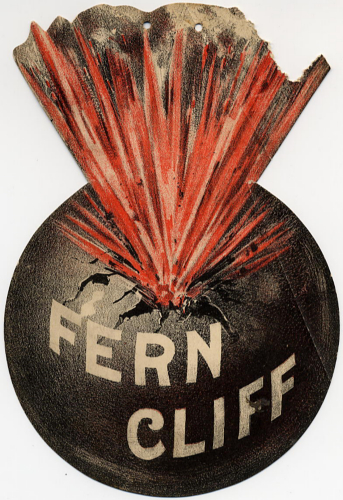 While Shenandoah told the romantic side of the South during the Civil War, Ferncliff told of the impact of the War on the northern folks back home. Shenandoah featured spectacular re-enactments of battles, while Ferncliff told its gentle, tragic story without any violence. The public response to Ferncliff was overwhelming. 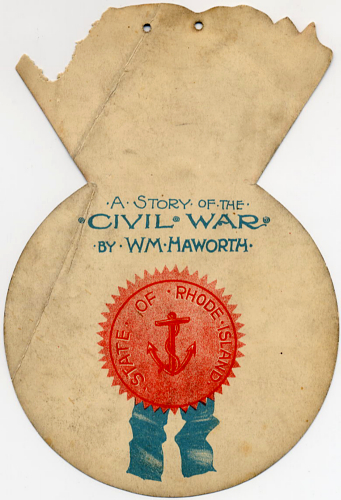 On opening night, the third act curtain fell with cries of "author, author," and William Haworth who was also acting in the piece, modestly stood before the curtain and bowed along with leading man E. H. Vanderfelt to an audience that included General Sherman. The New York News called Ferncliff "a soul stirring, pulse throbbing, beautiful story."